When purchasing a mattress, one of the first steps is choosing a mattress firmness level that suits your needs. Mattress firmness can be confusing, however. What one person feels is luxuriously soft may feel uncomfortably firm to someone else. While mattress firmness is somewhat subjective and dependent on personal preference, it is important to choose a firmness level that’s suited to your sleeping style and personal preference. Otherwise, you’ll suffer from more than interrupted sleep – you could develop problems such as back pain. In short, mattress firmness refers to how the mattress feels when you first lie down on it. Does it push back and feel stiff, or contour and cushion your body? Even though individual preference is subjective, there is a numerical mattress firmness scale to help you understand what to expect when you lay on a particular mattress. The scale runs from 1 to 10 and covers the three common mattress firmnesses: soft, medium, and firm. 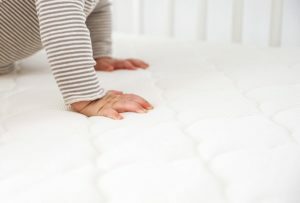 In this guide, we’ll discuss the mattress firmness scale, mattress firmness levels, and what firmness rating works best for different sleep preferences and body types. To learn even more about what to look for in a mattress, check out our comprehensive Best Mattress guide. Mattress firmness is something that most people only need to think about once every several years when they purchase a new mattress, but without a proper understanding of mattress firmness levels, that shopping experience can be bewildering and frustrating. What does “medium-soft” really mean as compared to regular old “soft?” Is there really a big difference between “medium-firm” and “firm?” Are there advantages to specific mattress firmness levels? We’ll help break down the different categories and describe them to familiarize our readers with how each firmness level feels. We’ll also discuss the pros and cons of purchasing each mattress firmness level – another important aspect of making your final decision. A soft mattress lands between 1 and 2 – the absolute lowest on the mattress firmness scale. Soft mattresses provide the least amount of support among all the levels of mattress firmness, and very few if any mattresses register as a 1 on the firmness scale. Although less support doesn’t mean zero support, you’ll definitely sink into a soft mattress if you sit or lie down on it. Soft mattresses offer a great deal of body contouring. This means that when you lie on them, softer mattresses conform to your body and hug it. They provide a comfortable sleeping experience for people who sleep on their sides and have problems with shoulder or hip pain when sleeping on a firmer mattress. The luxe materials that go into manufacturing soft mattresses typically put them on the higher end of the mattress price range. Materials such as memory foam make for incredibly soft comfort layers. While these layers feel great for sleepers who need them, they also cause some people to sleep hot. Soft foam comfort layers can also cause an initial offgassing odor when the mattress is unpackaged. 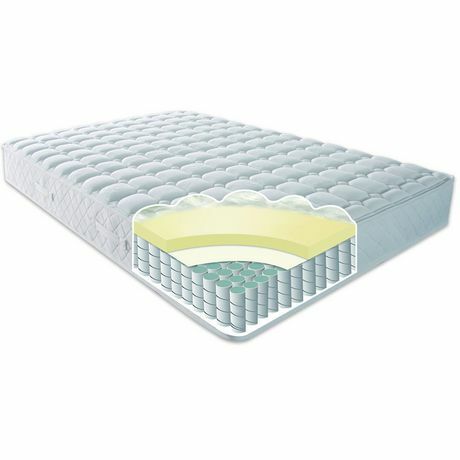 The softer materials are used for more than the upper comfort layers; they’re also used for the mattress support core. A soft support core doesn’t last as long as a more firm one, meaning that softer mattresses tend to have shorter lifespans than their firmer counterparts. Both of the “medium” mattress firmness levels provide a combination sleeping experience for those who need something in between soft and firm. Medium-soft is ideal for people who require a softer comfort layer for pressure-point relief but who need more core support than a regular soft mattress can provide. They’re still not ideal for people who require high levels of spinal support, however. A medium-soft mattress falls between 3 and 4 on the mattress firmness scale. Medium-soft mattresses still tend to feature foam materials in the comfort layers, but they’ll typically be made of a firmer memory foam or latex. When you lie on a medium-soft mattress, it will still contour to your body, but you won’t sink into it as deeply as you will a mattress with a softer firmness rating. Similar to a soft mattress, those with a medium-soft firmness level that contains memory foam or synthetic latex foam may cause offgassing odors for a period of time after unpackaging. Memory foam layers can also be problematic for people who frequently get hot when they sleep. The slightly more sturdy materials used to manufacture medium-soft mattresses make them a bit more durable than mattresses with soft firmness levels, but the overall longevity is still going to be much less than firmer mattresses. For a more middle-of-the-road mattress firmness level, medium-firm provides an excellent balance of contouring comfort and support. People who prefer a medium-firm mattress find them comfortable because they’re a great choice for different types of sleepers. Falling between 5 and 7 on the mattress firmness scale, a medium-firm give a nice level of contour while providing an ample amount of push-back. Unlike a softer mattress, medium-firm mattresses will usually have a noticeable amount of bounce. Most “universal comfort” mattresses fall into the medium-firm firmness level. They work well for a wide range of body types and sleep positions, from heavier sleepers who require a mattress with a great deal of support to combination sleepers who frequently switch positions throughout the night, and therefore need a mattress that feels comfortable no matter which side they sleep on. Mattresses that fall into medium-firm on the mattress firmness scale also fall into the medium range as far as price, being more affordable than a softer mattress, yet more expensive than firm mattresses. The materials used to make medium-firm mattresses are more dense and durable, which is why they tend to have a longer lifespan than softer mattress firmness levels. Falling between 7 and 10 on the mattress firmness scale, firm mattresses provide the most support out of all of the available mattress options (and it should be noted that very few if any mattresses have a 10 firmness). When you lie on a firm mattress, you won’t find yourself sinking into it at all. The comfort layers and support core of a firm mattress are designed to keep you sleeping completely on top of the mattress. Some people enjoy this, while others feel as though they’re sleeping on top of and away from the bed rather than actually being in it. A firmer mattress may be uncomfortable for side sleepers who need more cushion, as the firm sleeping surface can compress their hip and shoulder bones. This can create numbness, tingling, and even pain. The high level of spinal support in a firm mattress works well for heavier sleepers, however, as well as those who suffer from back pain. It also allows for maximum airflow and keeps people cooler as they sleep. Firm mattresses are typically less expensive than mattresses with softer firmness levels. Affordability doesn’t translate to a lack of longevity, however: mattresses that rate higher on the firmness scale also rate well for lifespan, as they’re made out of solid, sturdy materials. 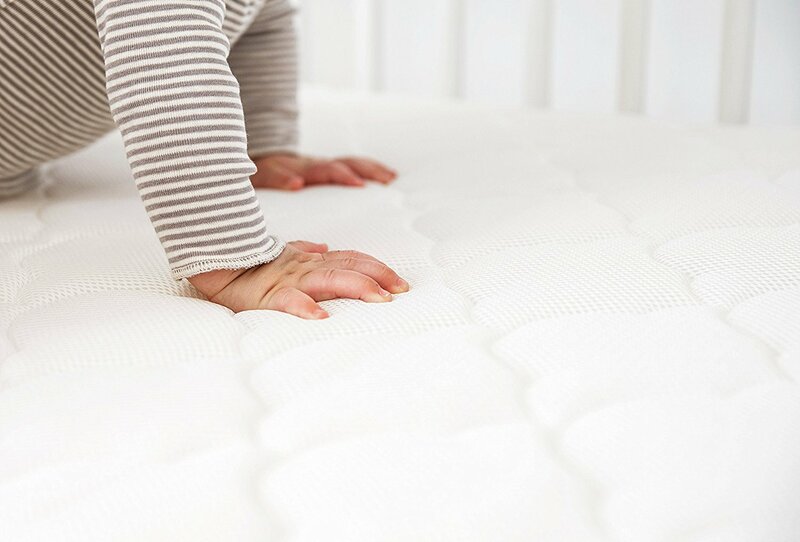 The numerical mattress firmness scale gives a more objective approach to describing what each firmness level feels like. Now that you have an idea of what each level is like, let’s look at what kind of sleepers are best suited to each. Choosing the best mattress firmness doesn’t work by simply testing out different ones and saying, “Ouch! Too hard! Yuck! Too soft! Oh! Just right!” When shopping for a mattress, you have to take into consideration long-term factors such as your body weight, whether you sleep with a partner, and if you frequently experience back pain. Lighter people don’t put as much pressure on a mattress. This means that they tend to stay on the upper comfort layers of a mattress when they lie down; they don’t sink down into the layers of the support core. Many lighter sleepers do well with a softer mattress. In fact, extremely light people (think 120 pounds or less) should shop around for a mattress that’s a bit softer than what would typically be recommended for their preferred sleep position. Because softer mattresses tend to be composed of plush, contouring materials such as memory foam, it’s a good idea to take your average sleep temperature into consideration. If you tend to sleep hot, look for a mattress with comfort layers that are designed to maximize airflow and direct heat away from the body. For an average-sized person, choosing the best mattress firmness level won’t be based as much on body weight as it will be other factors including sleep position, if you overheat at night, whether you sleep with a partner, and if you need to choose a mattress to help alleviate back pain. Mattresses that fall into either the medium-soft or medium-firm categories work well for many average-sized sleepers (which is why medium-firm mattresses are often labeled and sold as “universal”). If you have back pain or spend most hours of the night sleeping on your stomach, a firm mattress may provide the level of support you need to stay comfortable. When heavier people lie on a mattress, they come into greater contact with the support core of the mattress than average-sized or lighter people. This can lead to a sagging sensation, a feeling of sinking too deeply into the mattress, or feeling totally unsupported as you sleep. This is why a medium-firm to firm mattress is ideal for people weighing 200 pounds or more. In addition to having a strong support core, these mattresses will typically feature comfort layers that are more dense and will provide support that will allow heavier sleepers to rest on the upper layers of the mattress rather than sinking far into it. To learn more, read our guide to the Best Mattresses for Heavy People. If both halves of a couple have similar body types and sleeping styles, shopping for a new mattress is a snap. When one is lighter and the other is heavier, or one is a devoted side sleeper while the other one is a combination sleeper that moves all around during the night, finding the right mattress firmness level can seem complicated. In reality, it’s quite simple – a medium-firm mattress will fit the bill for most couples, even if they have wildly different ways of sleeping. This is why so many “universal” mattresses are marketed to couples. Search for one with the right combination of materials (cooling gel in the comfort layers or customizable layers of foam, for example) that are perfect for you and your partner. Read our guide to the Best Mattresses for Couples to find out more. Sleeping on the wrong kind of mattress is a common cause of back pain, which means that shopping for a new mattress is a way to start anew. One of the main reasons mattresses cause back pain is lack of support. Sleep on a mattress that’s too soft – especially if you’re a back or stomach-sleeper – and your spine will curve unnaturally in one direction or the other. To combat back pain, choose a firm mattress with ample support in the support core and comfort layers that provide enough cushion to allow your spine to fall into a slight, natural curve. If you suffer from back pain, check out our guide to the Best Mattresses for Back Pain to use as a reference as you shop. 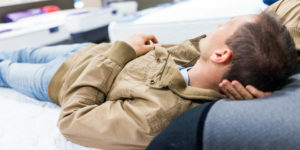 In addition to body weight and the number of people who will be sleeping on a mattress, you should also consider your favorite sleeping position when researching mattress firmness ratings. If you’ve never given any thought to what position you sleep in on most nights, you’ll need to pay close attention to this when shopping for a new mattress. Comfort layer and support core materials really make a difference in whether a back sleeper spends most of their night in a slump or if a side sleeper wakes up feeling stiff and sore the next day. When you sleep on your side, your shoulders and hips are the main parts of your body that come into hard contact with the mattress. This is why a soft to medium-soft mattress works well for side sleepers. The comfort layers provide body contouring that allows these body parts to sink into the mattress. Side sleepers who tend to sleep hot should look for a mattress with comfort layers that are breathable or infused with cooling gel. Firmer mattresses do not work well for side sleepers, as they compact the areas that touch the mattress and create pressure-point pain. Back sleepers spread out their weight as they sleep, which helps prevent them from creating painful pressure-points the way side sleepers do. It also means that back sleepers can find comfort on a wide range of mattress firmness levels. Choosing the right fit will depend on additional factors we’ve discussed such as body weight and potential issues with back pain. Keep in mind that extremely soft mattresses may not provide ample spinal support for people who sleep exclusively on their backs. Medium-range firmness levels generally work well, with firm mattresses being an ideal choice for back sleepers with chronic pain. When people sleep on their stomachs, much of the pressure is placed around their pelvis and hips. With a softer mattress, this can lead to a sharp curvature of their spine inwards (towards their stomach) as they sleep. Sleeping with one’s spine out of alignment in this way can create major problems with back pain. Stomach sleepers find better long-term comfort on a firmer mattress. This helps keep your pelvis, hips, and spine in a healthy alignment. The key to mattress-shopping, no matter your sleeping position, is to make sure that your back is in a natural position all throughout the night. Combination sleepers need a mattress that can be a jack-of-all-trades. It must provide ample support for back- and stomach-sleeping while allowing for contouring and pressure-point relief for shoulders and hips during time spent sleeping on one’s side. Which mattress firmness level depends most on what position you spend most of the night in. Medium-firm firmness is an excellent choice if you wind up sleeping most of the night away on your back, while medium-soft firmness will provide that extra layer of pressure-point relief if you frequently roll over and end up on your side. Body weight is the best place to start when choosing mattress firmness. Lighter people tend to fare better with soft to medium-soft mattresses. People of average weight can sleep on virtually any mattress and should choose based on sleep position, pain problems, and other factors. Heavier individuals need greater support, so a firm mattress is the best choice if you weigh 200+ pounds. Your size will give you a starting point when selecting a mattress firmness level. The next item to consider will be your preferred sleeping position. Back sleepers have a great degree of versatility when it comes to mattress firmness, as long as they feel they have ample spinal support. 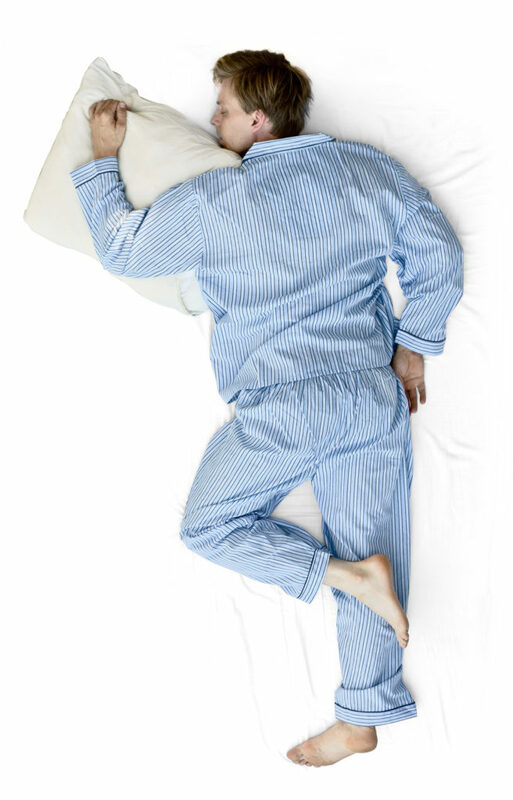 Side sleepers require enough cushion to prevent pressure-point pain from building up in their hips and shoulders. Stomach sleepers need a large amount of support to prevent their spines from curving in towards their bellies as they sleep. Mattresses in the medium range of firmness work well for combination sleepers who change positions as they snooze. If you have problems with back pain, make sure to stay away from mattresses that are too soft, as these may cause further problems due to lack of support. Medium-firm to firm mattresses are generally recommended to keep your spine aligned and supported correctly. People who sleep as a couple must discuss each of their body types and sleeping positions to see if they match up. If not, a medium-firm or “universal” mattress generally works well for both parties. Finally, sleepers who overheat at night should be aware that memory foam and other softer comfort layer materials tend to trap heat. If you need a softer mattress but struggle with keeping cool as you sleep, look for a mattress that’s designed for optimum temperature control.